We have had 2 official full days of sun. I had to take pictures to prove to you that the sun does, in fact, exist here in Naples--and oh, it was glorious. Nothing but Italians and their sunglasses. Everywhere. That's Piazza Plebiscito. Go ahead, try to say it without spitting. All of the sudden, people ran screaming as the whole city turned sepia. Ahhhh...Glorious! It's beautiful and sunny here too! I'm taking advantage and doing laundry (yahoo, right?) and going for a bike ride on the flat, flat Padania Plain. See ya! So glad you got the sun! IT'S SPRING!!! Popping out all over...even when it rains (which we need, of course, for the flowers). Love the pics! Great pic of Piazza Plebiscito, Tracie! It made my Neapolitan hubbie very homesick, as he used to live right around that area. Did you have some espresso at Caffe' Gambrinus? I LOVE that place! 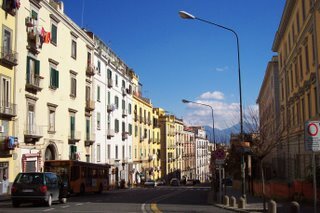 Thanks for the great blogs and pictures....Naples feels right around the corner because of you. what a sweet compliment...i'll keep the pics coming :) and yes, we were at gambrinus! but i had a prosecco...it was apperitivo hour. Lovely! I laughed so hard at your last comment... I love it... Yeah - wonderful weather here we come. Tracie b. - in the Galleria next to the piazza there is a small shop that serves "il cafe del professore". Have you tried that yet? 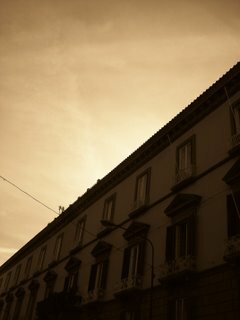 The picture of plebiscito is beautiful, but I also like the one of the street. It seems to go on and on. Piazza Plebiscito is a beautiful place. But you're right -- when I say it, I end up spitting all over my monitor. Would you rather have no sun or no rain? It's supposed to be Spring, but my whole yard is brown. We had no rain forever, and then it flooded for two days, and now it's back to the good ole' Texas HEAT! Just thought I'd say hello . . . later! We've had sun too!!! For 3 or 4 days!! !